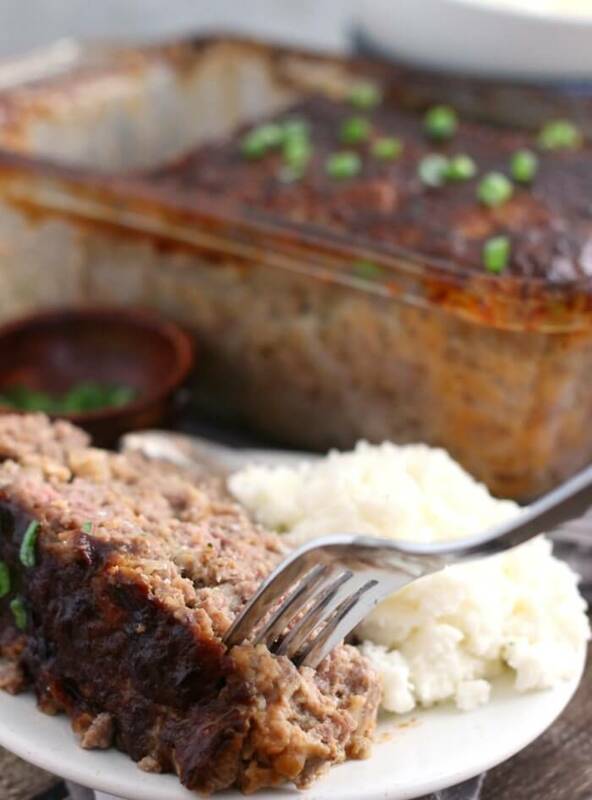 Our meatloaf recipe is a classic comfort food, easy and delicious to make. 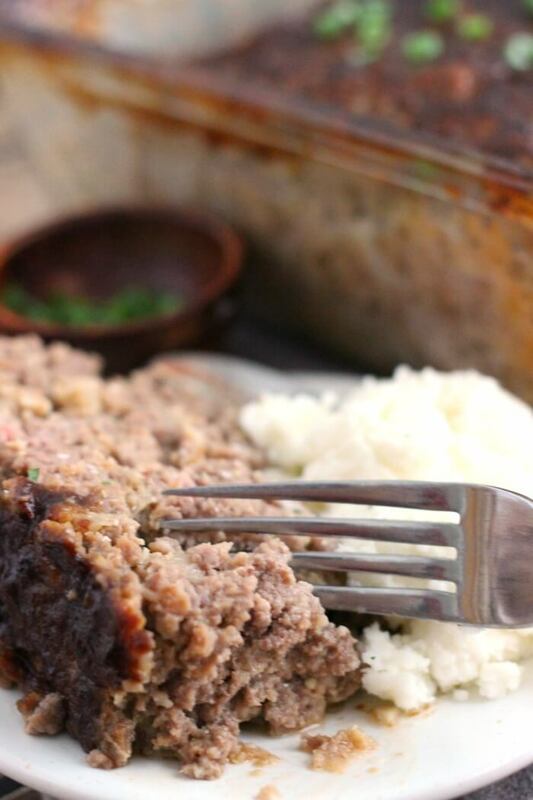 This meatloaf recipe is the best meatloaf you’ll ever make! I like to make two meatloafs at once and freeze the second one for an easy dinner later. Serve your meatloaf with dinner rolls, mashed potatoes, roasted broccoli, and for dessert pecan pie! Ground beef – If you want a moist meatloaf, make sure not to use a super lean beef. The more fat in the meat, the more flavorful and moist it will be. Onion – Onion also helps keep your meatloaf recipe moist. We like to grate the onion and mix it with the wet ingredients. If you’re unable to grate your onion, then you’ll want to saute it first in a little bit of oil or butter. Ritz crackers – I love the salty butteriness of ritz crackers, but in a pinch you could also use breadcrumbs, panko, or saltines. Eggs – Eggs work as a binder to keep the meatloaf from crumbling up. 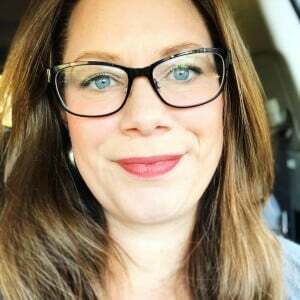 Garlic – Is food even worth eating if there’s no garlic? (No). Ketchup – Ketchup brings in that savory tomato flavor but also a touch of sweetness. 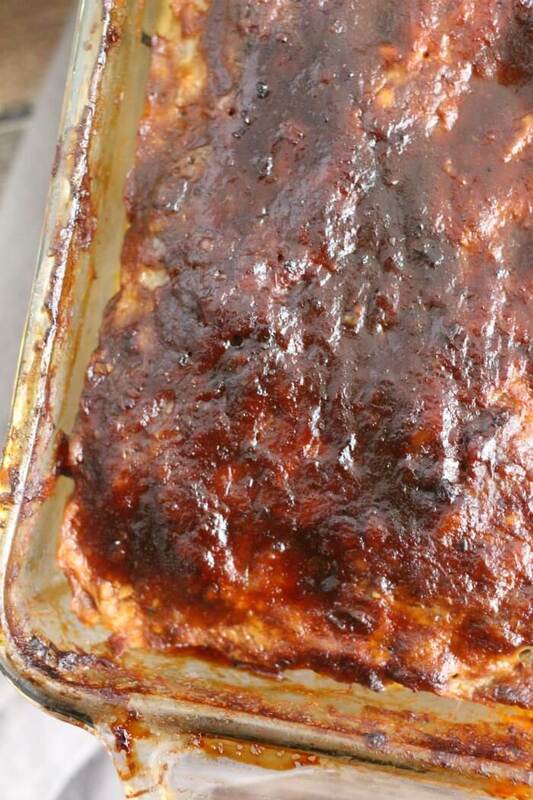 Barbecue sauce – Barbecue sauce mixed with ketchup for the topping makes this recipe sing. Mustard – We use mustard for tanginess, I love what some good stone ground mustard adds to the meatloaf. Worcestershire sauce – Salty and tangy and delicious. It’s a perfect compliment to ground beef. Bouillon – Bouillon helps intensify the beefy flavor of our meatloaf. If you’re out of bouillon (like we were in the video!) just double your Worcestershire sauce. First combine the onion, crackers, eggs, garlic, ketchup, mustard, Worcestershire sauce, and bullion. Mix well. Next add in the ground beef and knead together until all ingredients are well combined. Then add meatloaf mixture to a loaf pan and bake, covered. While the meatloaf is baking, whisk together ketchup, barbecue sauce, and Worcestershire sauce. Remove meatloaf from oven, uncover, drain excess liquid, and baste with glaze. Finally, return to oven until baked through, and then enjoy! 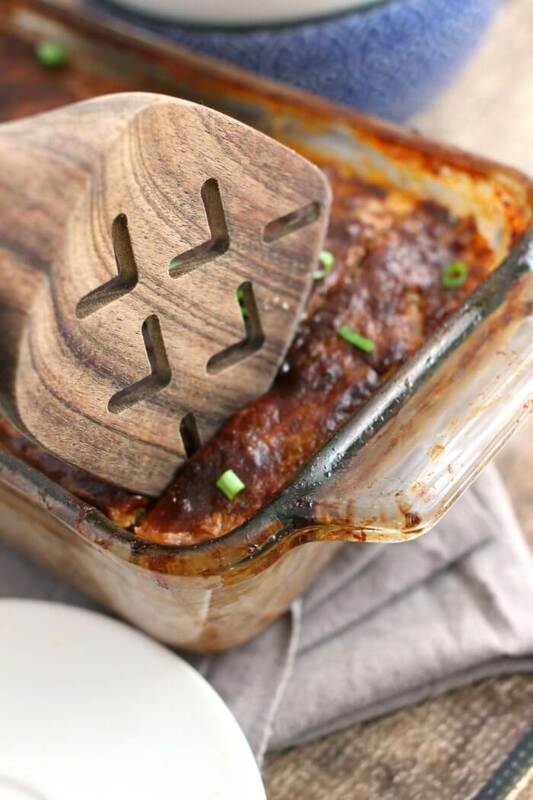 – Make it a spicy meatloaf by adding some pickled jalapenos to the loaf and a dollop of sriracha sauce to the glaze! – Create an Italian meatloaf by using Italian breadcrumbs instead of ritz crackers, and topping with spaghetti sauce instead of our ketchup glaze. – Go mini by baking your meatloaf recipe in muffin tins. Perfect for packing in lunches. – Give it some Asian flavor by using Panko instead of ritz crackers, switch the Worcestershire sauce for soy sauce, use teriyaki sauce instead of ketchup, glaze with teriyaki sauce, and finish with a sprinkle of sesame seeds. Meatloaf is done when it reaches an internal temperature of 160 degrees. Sometimes the inside of meatloaf will still be a little bit pink. This can be due to other ingredients such as ketchup, or sulfites. The best way to tell when your meatloaf is done is by using a meat thermometer. Meatloaf can be frozen. For best results when freezing meatloaf, bake it in a disposable loaf pan, or with a parchment liner. Allow the meatloaf to cool completely in the refrigerator, then wrap tightly and freeze. Meatloaf will last several months in an upright freezer, or up to one year in a deep freezer or chest freezer. Alternatively, you can slice the meatloaf and freeze it in individual portions for easy lunch packing or quick dinners. You make meatloaf moist by using meat that isn’t too lean, adding moisture to the recipe via onions, ketchup, and egg, and by soaking your breadcrumbs or crackers in the wet ingredients before mixing them with the meat. Also, I find meatloaf comes out much more moist when baked in a loaf dish as opposed to being baked on a baking sheet. Crumbly meatloaf is general caused by one of three things, or a combination of all: not enough liquid, not enough bread, and/or the loaf wasn’t kneaded well enough. If your meatloaf was dense and crumbly, it likely needed more liquid. If it was loose and crumbly, it likely needed more bread (for binding), and to be better mixed (to make sure the ingredients are well incorporated with one another). For more liquid, try adding milk (will add moisture but not flavor) or ketchup (will add some tomato flavor and sweetness) in tablespoon increments until you reach desired consistency. For more bread, add additional crushed crackers or breadcrumbs in 1/4 cup increments until you reach your desired consistency. If your meatloaf is dry, you need to add more liquid before baking. Try adding milk (will add moisture but not flavor) or ketchup (will add some tomato flavor and sweetness) in tablespoon increments until you reach desired consistency. The loaf before baking should be wet, but not runny, and just moldable enough to hold its form. 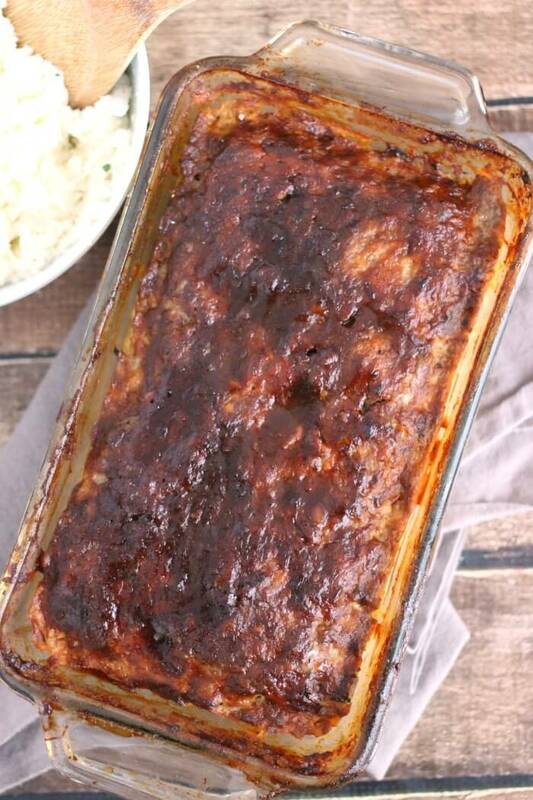 Loaf pan – This is a 10×5 loaf pan, which is what I recommend for this meatloaf recipe. Don’t use a smaller one like I did because you run the risk of making a massive mess in your oven! Pyrex mixing bowls – These glass bowls are big and gorgeous and perfect for mixing everything from ginger cookies, to pizza dough! 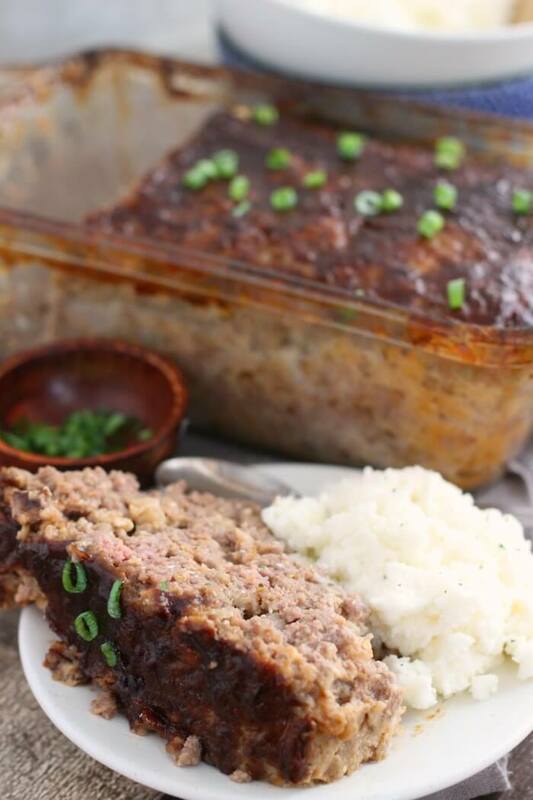 This meatloaf recipe is the best meatloaf you'll ever make! I like to make two meatloafs at once and freeze the second one for an easy dinner later. In a large bowl combine onion, crackers, eggs, garlic, ketchup, mustard, worcestershire sauce, and bouillon. Mix well. Add ground beef and knead together until fully incorporated. Do not overknead. If mixture is too wet, knead in additional crushed crackers. Press into a 10x5 loaf pan and cover with foil. Bake at 350 degrees for 60 minutes. While meatloaf is baking, whisk together ingredients for glaze. After 60 minutes, uncover and drain off any pooling liquid. Baste top with glaze. Return to oven uncovered for an additional 15 minutes, until the center of your loaf reaches 160 degrees. I love the triple glaze on this meatloaf! I am going to claim it as my secret sauce. I like to make meatballs, but I hate it when my hands get SO greasy making the balls, and then when there is SO much grease floating in the pot. So I tried something one day and now have the solution. Instead of having all that unhealthy beef fat in the mix, I use 90% lean beef and I add olive oil for the moisture. My meatballs come out nice and moist. Give it a try. I’ll have to try that, thanks for the tip! Comfort food to the max! The glaze looks delicious. So tender and juicy, exactly what a good meatloaf recipe should be! This is a fantastic classic recipe and so juicy! The glaze is incredible. 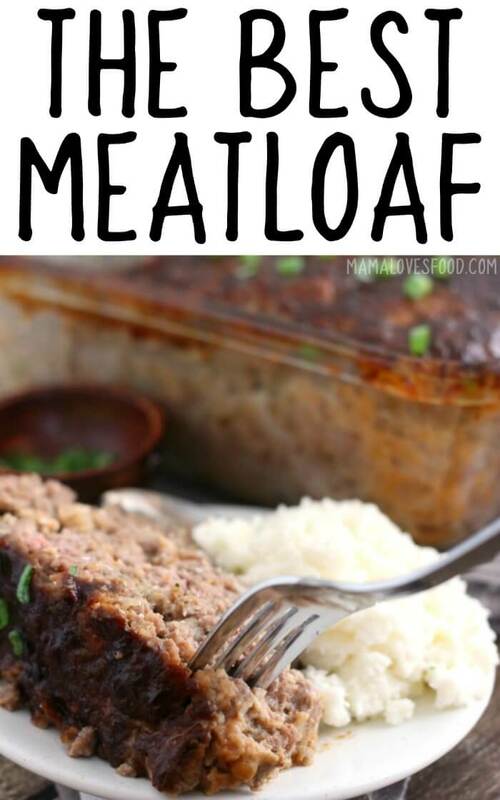 Meatloaf is one of my favorite weeknight meals! Love this recipe! The ultimate in comfort food! I can’t wait to try this for dinner with my family soon! We really enjoyed this! Thanks for the fabulous recipes!